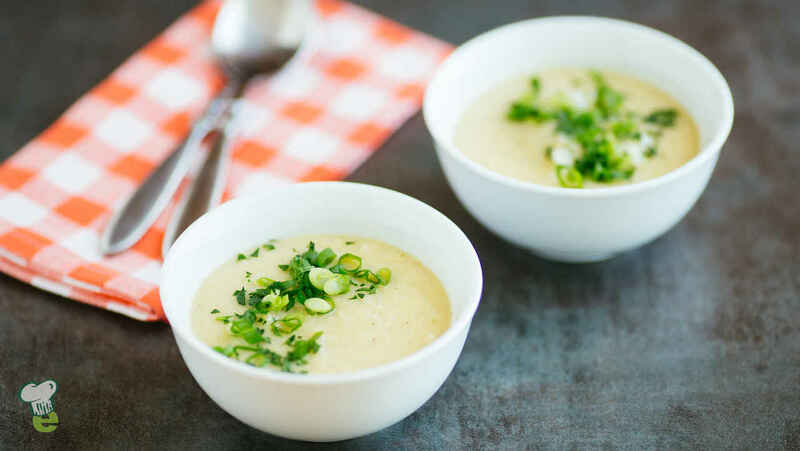 Just a touch of coconut milk gives the soup a creamy texture without a lot of fat. Preheat oven to 400°. In a large bowl, combine the leeks, cauliflower, shallots, garlic, olive oil and 1/8 teaspoon of the salt. On a baking sheet, arrange the vegetable mixture and roast for 25 minutes, or until lightly browned. In a large saucepan, combine the roasted vegetables, potato, vegetable broth, coconut milk, thyme and black pepper to taste and bring to a boil over medium-high heat. Reduce heat, cover and simmer for about 10 minutes, or until vegetables are softened. Soup will be thick. Add water to reach desired consistency, if necessary. Using an immersion blender (or regular blender), blend the soup until smooth. Season with remaining 1/8 teaspoon salt and black pepper to taste. Garnish with scallions and fresh parsley, if desired.